The 82-year-old Jesuit Pope Francis had received a red carpet welcome in the Emirates, which prides itself on its tolerance and is home to a remarkably vibrant Catholic community of about 1 million. 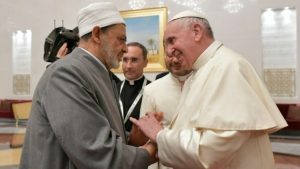 He was accompanied for much of his time in UAE by Sheikh Ahmed el-Tayeb, the Grand Imam of Egypt’s Al Azhar university and Mosque, the seat of Sunni learning. 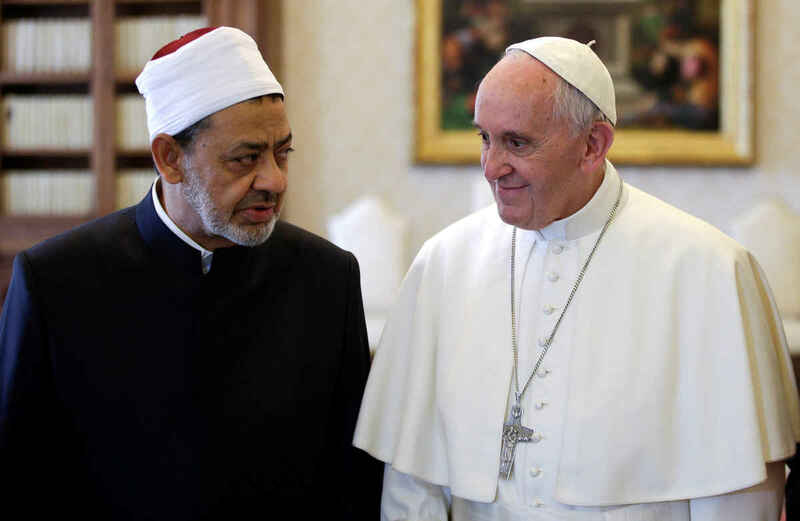 Francis looked upon the Grand Imam, as his brother and his dear friend. 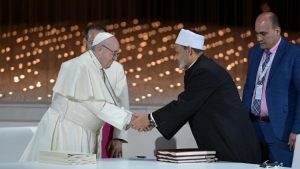 In a move to fight religious fanaticism and improve relations with the Muslim world the Jesuit pope capitalized on his relationship with Sheikh Ahmed el-Tayeb, to make the historic trip. After being given a ceremonial reception at the Presidential Palace, the pontiff had talks with the Rulers on peace and tolerance. Shaikh Mohammad welcomed the two great guests to the Human Fraternity meeting, which laid emphasis on pluralism and inter-faith dialogue for the good of humankind. During the event, Shaikh Mohammad Bin Rashid launched the first edition of the Human Fraternity Award. He awarded the honor to Pope Francis and Dr Al Tayeb for their efforts in promoting world peace. 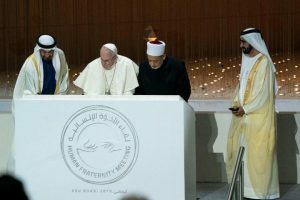 At the end of the inter-religious meeting, His Highness Sheikh Mohammed declared that a new church and mosque will be constructed in Abu Dhabi in honour of the historic visit of Pope Francis and the Grand Imam of Al Azhar Al Sharif, Dr. Ahmad Al Tayyeb to the UAE. The new places of worship will be named the ‘Church of Saint Francis’ and the ‘Mosque of Grand Imam Ahmad Al Tayyeb’. The foundation stones for the projects were signed by His Highness Sheikh Mohammed bin Rashid Al Maktoum, Vice-President and Prime Minister of the UAE and Ruler of Dubai and His Highness Sheikh Mohamed bin Zayed Al Nahyan, Crown Prince of Abu Dhabi and Deputy Supreme Commander of the UAE Armed Forces, in the presence of Pope Francis and the Grand Imam.